I was laying on the roof of a building with a friend while we were waiting on a buddy to get out of class. My friend was walking around on the roof while I was lying down. I was staring up at the stars when I saw a bright white elongated diamond shape appear out of nowhere. The object looked as though it was coming through the atmosphere because it had a contrail but the color was nothing like a comet’s trail; It was more of a pink color. The ‘front’ of it was the elongated, more acute angle (i.e. the pointier end of the diamond). It traveled a short distance in a straight line before it disappeared. (approx. 2 inches if I held my arm straight up). The contrail seemed to be coming off of the object and disappeared just as the object did. At this point I yelled “Holy ****! Dude did you see that?” Just as I was saying this I saw another white diamond appear in the same area of sky. This time the contrail was red/purple. The object flew perpendicular to the first object’s path. It seemed a little bit bigger than the first one, but I am not sure if it was the same object a little closer or if it was a second object. This object was visible for the same amount of time (1-2 seconds) before it vanished just like the first one. I wanted to make sure my friend saw it, so I yelled “Look up!” and pointed towards the area as the second one was going by. By the time he looked up it had vanished. Then a third diamond appeared in the same area of sky! This time its path was parallel to the previous one; the flight path of all three basically made the shape of a capital ‘H’. It was bright white like the others but there was no trail coming off of the object on this pass. It moved slower this time and it was much closer; I could actually see the diamond shape spin on its long axis! Again, it vanished after a couple of seconds had passed. I asked my friend if he saw it too, he said “Yea, what the hell was that? !” (More like he yelled in a panicked tone). Of course, I had no answer for him. At this point I felt a wave of anxiety come over me and I wanted to get off of the roof as quickly as possible and go somewhere inside. So we both hurried down to the ground and went indoors. I asked him what he saw and he basically said it looked like a bright spinning arrowhead that appeared and disappeared. The images of them have been burned into my memory and I have reflected upon that moment quite often. I am not sure if it was the same object slowly making its way through the atmosphere or three separate objects. 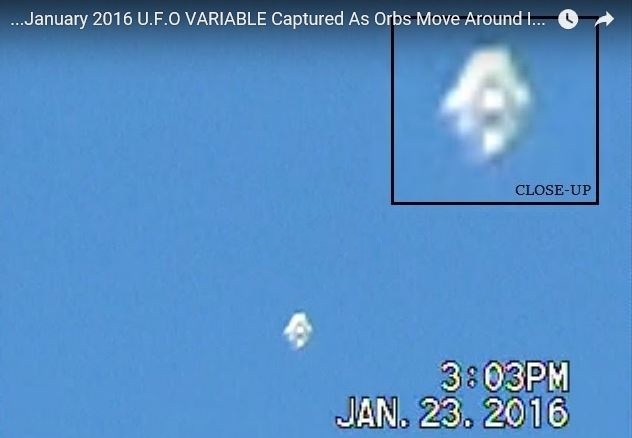 I am also not sure if the brightness of the object was from the heat produced by an object entering the atmosphere, but that is the only explanation I can think of; it still bugs me that the third sighting had no trail but was still bright white. I simply do not know how to rationalize it. NOTE: The above image is a rendering. Reports state that Javier Torres and Alejandro Dueñas took the images while driving from Colima to Guadalajara. The mysterious disc-shaped object flew above them as they were taking pictures of the surrounding landscape. The four-image sequence is considered as one of the best pieces of evidence of UFOs on Earth. The mysterious disc-shaped object flew above them as they were taking pictures of the surrounding landscape. The images which are beyond fascinating according to ufologists depict a classical flying saucer, which, according to many, could have been very similar to the mysterious disc-shaped object that crashed into Roswell a decade earlier. Jaime Mausan, a renowned Ufologist from Mexico states that these images are a true historical treasure. The images have already been categorized as the best pieces of evidence of Unidentified Flying Objects in Mexico. Ufologists around the world believe that these images undoubtedly prove that extraterrestrial visitation have occurred in the distant past, and continue to do so in the present. Mexico is well known for having numerous UFO sightings across the country. [Their most famous volcano, the Popocatepetl is considered by many as an enigmatic natural formation which attracts hundreds of UFOs each year, some of them have even flown into the volcano.] As far as Ufologists are concerned, these images prove that UFOs are not a modern-day phenomenon and are not, in any case, an isolated event as some skeptics suggest. While looking at the images, Ufologists state that we can clearly observe how the light reflects from the objects suggesting it had to be metallic in nature. In one of the images of the mysterious objects, we can clearly see numerous small ‘windows’ along the border of the UFO. It was an unusual night with fog on the river, warm weather when it should be cold and/or snowing. The fog stayed close to the ground reaching a few stories in the air at most. I went to town to buy something and made my purchase right after they called “Shoppers, you have 10 minutes…” so I know it was about that approximate time when I arrived home. I drove the rural way home along the river. I live very close to the river. When I was getting very close to home, I noticed a cluster of 3 orange lights very close to me over Neighbor A’s yard across the road from me or right on the river; that’s how close we are to the river. I live in a rural area so the neighbors’ houses are a few hundred feet from each other. This cluster of orange lights was about helicopter height. There was no structure to support the lights or I could not see the structure even though it was above the fog. The lights beamed a little. They looked exactly like the street lights on my road with the same color, same size, and same slight beam of light except that I was looking at a cluster of 3 lights. The orange lights stayed stationery as I drove down my road and into my drive way. I had never seen orange lights this low in the sky and there was no structure present as to why the lights would be there. I parked the car in the back of the house and ran to a front corner of the house to see if the cluster of lights were still there. It was but it started slowly moving in a straight line, moving closer to me. I ran the short distance to get my sister to come outside and look at “this big plane”. There is frequent unusual activity in the sky here so she put on shoes and came running out. What I witnessed before she got outside was a giant black triangle shape reveal itself over Neighbor B’s house which is the 2nd house from me to the west. The triangle went in a straight line over Neighbor B’s house, it backed up a little bit like it changed it’s mind and then traveled in straight line directly at me. It had descended to top-of-tree height by now. Was it going to crash? Why is it so low? What is it? I was scared and wanted to run somewhere but where to? I was in the middle of the yard and if I ran in the house and it crashed, that was not a great place to go. If it was looking for me, it had already spotted me. My sister arrived outside and looked up to see it just as it started to travel in a straight line from Neighbor B’s house. It had great height to it. It was not a flat triangle. It was several stories height. It was flat black or dark gray color. It was way larger than a football field. It was enormous. It was so close, detail was clear of it’s structure, size and lights. It turned on it’s bottom lights on it’s way over to my yard. It had varied bottom lights. Outlining the craft were small white lights with 3 sets of red/green lights. In the middle was a large triangle area of what looked like white LED lights glowing. The pattern of these white lights was indescribable. Was it showing clouds or transparency? As the triangle front endpoint arrived at the yard, it started emitting this hydraulic engine type of noise, loud, roaring, and bumpy sounding. I’m familiar with hydraulic engine sounds as to the many boats on the river here and that’s the closest I would describe it. (I had heard that same loud engine noise travel the entire sky a few weeks prior to this event from inside my house. I ran outside to sight what would make that loud noise and I could not see it.) It scared me so I didn’t look when it was directly overhead but my sister watched it. I could still see it even when not looking directly at it. The white lights glowed. I looked up at it after several seconds, and it was still there, hovering/moving very slowly. 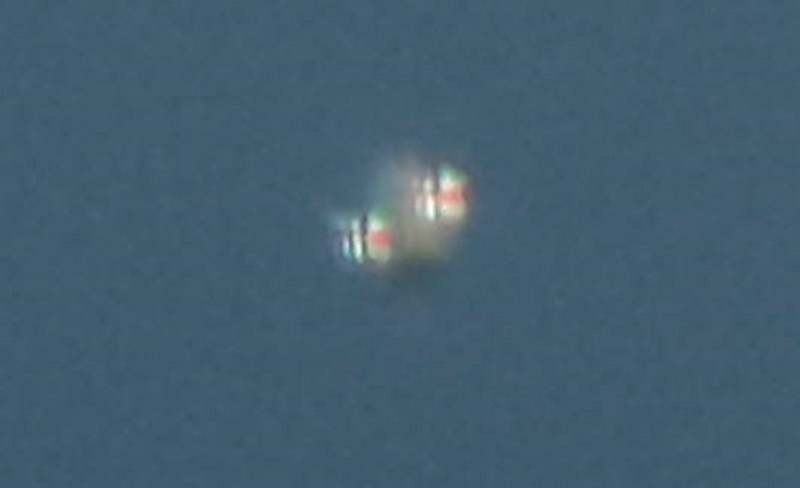 I got a good look at the bottom lights at this time but still don’t know how to describe the white lights in the middle, what pattern the white lights were. Maybe it was a transparent area as well as being lit up. If she hadn’t come outside when she did, I was on my way to hiding. Instead, she came outside and yelled at it to get out of here. The noise was loud enough that I couldn’t hear her yelling at it. I felt responsible for calling her outside to see it and I didn’t want it to get her so I stayed while making useless getaway plans and getaway movements. She seen it approach but she didn’t realize how close it was because of night depth perception issues. I wouldn’t have yelled at it but she did and I’m glad. I hope that’s what made it go away. 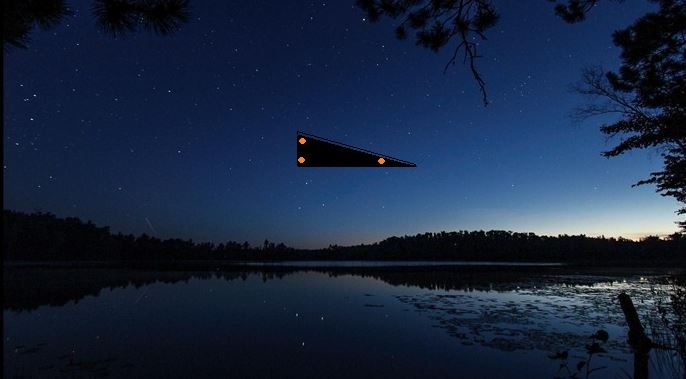 We watched it until the end of the triangle shape went over us. It turned off it’s sound and lights after it went over us. The black triangle disappeared into the black night and we didn’t stand around outside after that. When the sky is heavy with water like that, you can’t see the stars, it’s just very dark. We still marvel over seeing this triangle. We talk about it every day. I’m nervous when I have to frequently walk back and forth between the 2 houses on the lot here. You don’t want to see it again but you want to. Such a mixture of feelings, it was a major event for me. NOTE: The above image is a rendering. It was a little after 10pm on a friday night, it was my friend and I in my car and we were parked right beside a bridge waiting to meet another friend. I just pulled in to park so we could wait and before i could even put my car in park I see an object in the sky. At first i thought it was someone who lived beside the river shinning a spot light or even a boat with a spot light, but it was just so spherical in shape and it was bright. 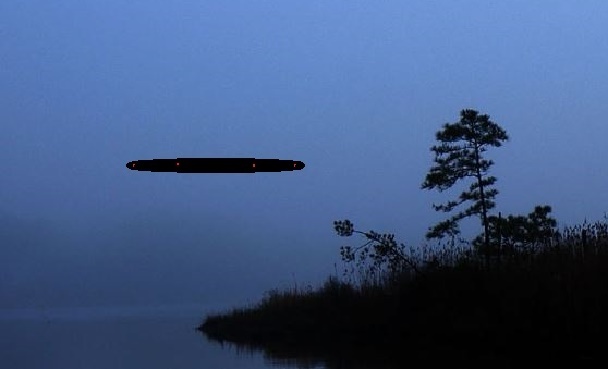 This thing was just hovering right over the river moving from left to right slowly. I was left speechless watching the mysterious object just slowly start going towards the sky and then in the blink of an eye it melted like a tear drop in the sky. As soon as the object just vanished I shouted to my friend did you see that but unfortunately she was on her phone not paying any attention to what was going on. It all lasted approximately 30 seconds at most. Something is out there flying in the sky and I cannot explain it but it clearly had camouflage cloaking. I have always believed that there is life out there I just never thought I would see it with my own eyes. Something is out there in the sky for sure. NOTE: The above image is a rendering. I remember an event when I was a kid. I recall waking up in my mom’s room and seeing two- what I called big guys kneeling at the foot of the bed- they grabbed my heels and began to pull me. However, they were not pulling my body but like- my soul- was being pulled from my body. (that’s what I thought as a kid.) Shortly after that event, I began to bleed when I had a bowel movement. My mom took me to our family doctor and he asked me “have you been putting things in there?” I was floored by this question, of course. My mom asked him why and he said it looked liked something had torn my colon. I thought I dreamed of being probed by these doctors with hoods on. Anyway, years later, I saw the movie “Communion” and I almost began to hyperventilate when I saw the “creatures” in that movie. The “doctors” who came to get him, were the exact guys I thought were kneeling at the foot of my bed. They were, in fact, not kneeling but very short with regular sized upper torsos. At about 16 or 17 two of my friends and I saw, what we believed was a UFO in an area called Mt. Airy Forest, in Cincinnati. We were all in art classes at our high school and we were talking about what we had seen. Our art teacher separated us and had us draw what we each had seen. The pictures were different but, when we discussed the positions we were in we actually had a full view of what we had seen from 3 different angles. I now live on the top floor of a high rise with a view of 20 miles all around. 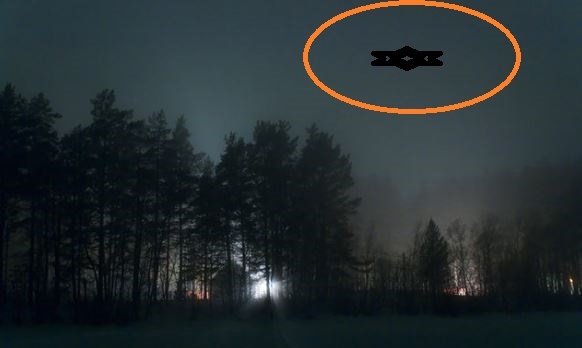 I have seen strange thing in the sky lately but nothing compared to that event in the forest. NOTE: The above image is a rendering. 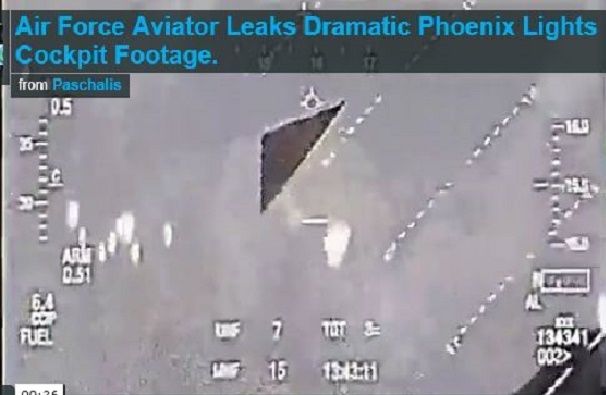 Classified military footage of the Phoenix Lights UFO phenomenon has recently been leaked by a former U.S Air Force aviator. The footage reportedly captures never-before-seen cockpit footage of Lockheed-Martin F-16 and Fairchild Republic A-10 Thunderbolt II fighter jets in action the night of the original incident 17 years ago. 56th Fighter Wing Public Affairs at Luke has received numerous inquiries and requests, but has remained silent on the footage. The report claims additional footage of multiple civilian casualties has been obtained. The Phoenix lights incident is one of the largest UFO sightings in North America. Thousands of Arizona residents became alarmed when they noticed a sizable object in the sky above Phoenix 19 years ago. Multiple eyewitnesses reported a diamond-shaped craft hovering above the city for at least a coupleof hours. Nineteen years later, questions about the Phoenix Lights are still being asked. Arizona residents still remember the phenomenon and the new footage has stirred more tension around the 19-year-old event. The lights have been the subject of intense scrutiny, government denials and internet documentaries.This never-before-seen video of an engagement during the Phoenix Lights was leaked online this weekend, by KWBTV NEWS JOURNALIST DAVID COLLINS. The FLIR [ night scope ] video purportedly depicts military and unknown craft on the night of the mass sighting over Phoenix in 1997. Hey all, please no ridicule, I’m telling not one word of a lie.. I still can’t fathom what the hell I witnessed. I’m writing this in hope that someone that night witnessed something, as I was alone, just my dog & I in my car. I’m from South Australia. Last night at around 10:50-11:00PM driving down South in Onkaparinga /Hackham driving along States Rd /Penny’s Hill Rd, I witnessed a massive weird shaped object on a vertical angle. I pulled over & watched it just suspended there with Clear glowing white bright lights under neath it, made absolutely no sound. It looked very very overwhelmingly large sinister looking, sort of dark metallic ripple look. Nothing what I would have suspected a UFO would appear to look like. It was suspended there not that far above the housing suburb maybe 6 streets away and looked around 3-4 houses large if not much wider. My brain was pushing that much adrenaline/anxiety all at once, couldn’t comprehend what the hell I was witnessing. Once it flew away, I drive quick down Penny’s Hill following its view . It flew very gracefully with elegance like a plane, but simultaneously at a very quick speed North/West. No sound still the whole time. Once it moved on, was out of view in about 20 seconds. Felt like minutes and my heart was racing like hell. I’m hoping someone witnessed this & not just myself . I know exactly what others probably think , but trust me , I still having trouble grasping this I was hoping you guys may have a photo of what you may think it could of been. As if all happened in under a minute & it was a hell of a lot to mentally take in, when it’s so far out from reality of the norm. Thanks this is very important to me. NOTE: The above image is a rendering. Special thanks to Matt H. for this exciting account. THIS WAS SUBMITTED TO WORLD UF PHOTO……. Here’s one new daytime sighting of a two bright orbs hovering in the sky above San Antonio in Texas. This was taken on Saturday, 16th January 2016. 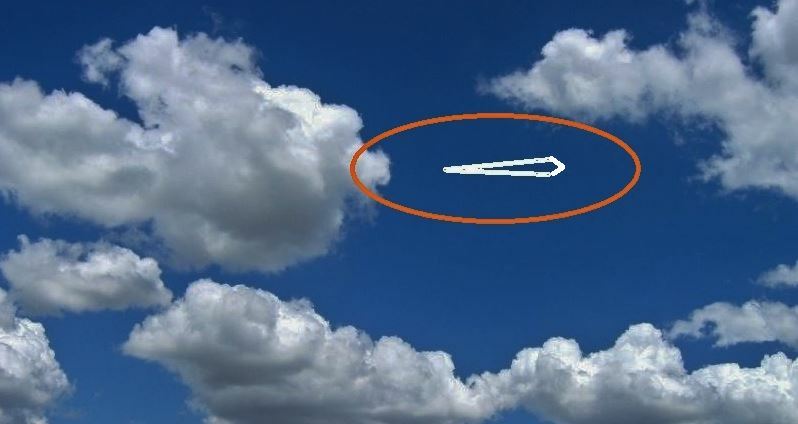 Witness report: As I was Skywatching facing north, I Notice this object high altitude it did not appear to be an aircraft. 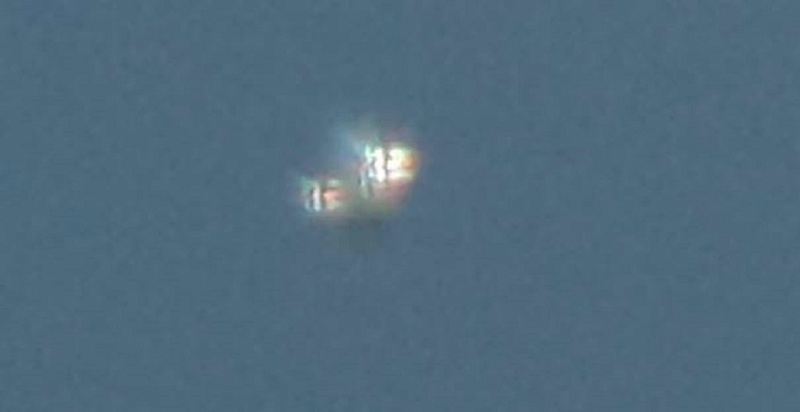 When zooming in two rotating Orbs traveling high in altitude came into view. 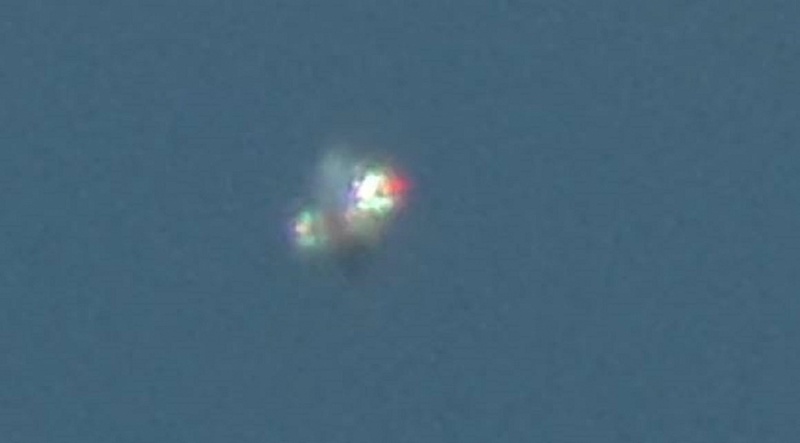 You can clearly see a Larger Orb and a Smaller Red underneath. They were traveling at high altitude used the top of the roof top as reference point(giving the altitude it was traveling). 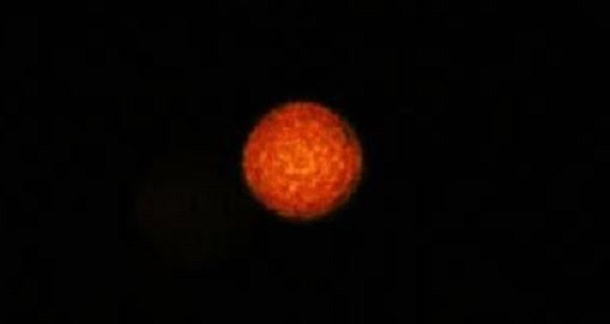 At one point you can see the Small Red orb Enter/Exit the Larger Orb. They appear to be under some sort of controlled and they traveled in constant speed,direction and elevation. On the video stills you can clearly see smaller U.F.O Enter/Exit larger U.F.O. I tried to keep them in frame as they traveled. I followed them until losing sight of them. In my opinion these glowing objects were clearly no aircraft,weather-balloon or satellite. Thanks for reading my email. I had an incident this past weekend that has me wondering what is fact or fiction. This past Monday night I was driving home from work around 9:45 PM. I live in a very rural area south of Falls Village, CT. and I was only 2 miles from my residence. The roads were still slick from the heavy snow we had received, so I was driving very deliberately. All at once, a deer jumped from behind a snow bank and bolted in front of my car. I slammed on the brakes but still skidded into the back of the deer. I didn’t see where the deer went, but I was now stuck in the snow bank. I got out of the car and noticed that my driver’s side headlight was smashed as well. I tried to push the car out the snow bank but it was not budging. So I had no choice other than to call for a tow truck. About 15 minutes after I called for help, one of my neighbors was on his way home and stopped to ask if he could help. I told him I had called for a tow truck but I didn’t know how long it be before it showed up. He said that he would go home, grab some chains and return with his 4-wheel drive pickup in order to pull me out. I thanked him and he left. Not long after my neighbor had left, I noticed lights coming toward me on the road. The lights were large and very bright, so I figured that it was the tow truck. As the lights slowly proceeded towards me several more lights illuminated above and below the others. The vehicle, or whatever it was, stopped about 50 yards from me and remained there for several minutes. 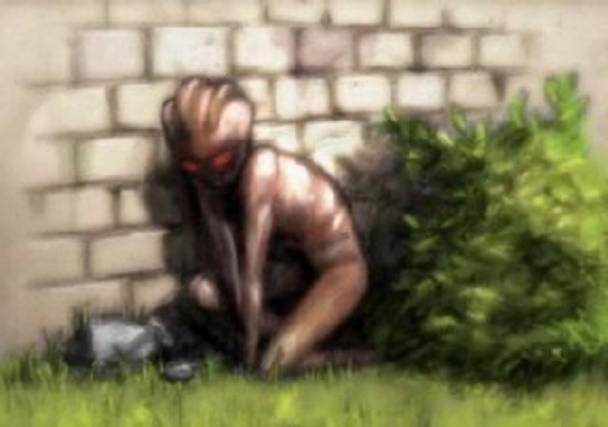 Then all of a sudden I witnessed a brightly lit ‘being’ floating through the woods across from me. It reminded me of those bright white aliens from the ‘Cocoon’ movie though I didn’t see any facial features. This being quickly floated through the trees then out onto the road. It started to come towards me but I was petrified. I just could not move. It didn’t have arms or legs but there was definitely a head and something on the end that resembled a fish tail. It stopped directly in front of me and hovered no more than 10 feet away. There were no eyes or mouth, but I did feel warmth coming from it. It was very calming and comforting. Then it suddenly whisked towards the lights. After a few minutes the bright lights started to fade until it was completely gone. My neighbor soon returned, as well as the tow truck operator. I asked them both if they had noticed any vehicle with intense bright lights, but they both looked at me like I was crazy. After they pulled me from the snow bank I drove home, quickly took a bath and headed for bed. I was still feeling a calming sensation and desperately wanted to go to sleep. I was off work on Tuesday so I decided to go and have my headlight fixed. As I approached the area where I had been stuck the night before, I noticed that the area where the lights were was completely barren of snow and the roadway was dry. Did I have an alien close encounter? To be honest with you, I don’t believe in UFOs, aliens or any of that weird stuff. But I am having seconds thought as to what I witnessed. Was it simply a spirit of some kind? I have had dealings with ghosts and spirits since I was young. What is your opinion? NOTE: The above image is a rendering. 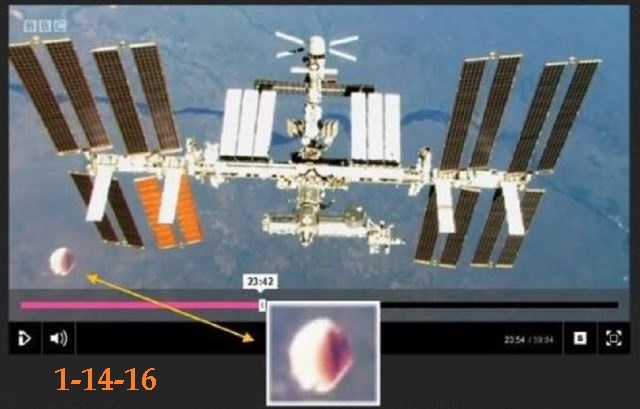 NASA’s live camera aboard the International Space Station (ISS) captured a mysterious boomerang- or V-shaped UFO whizzing past the habitable artificial satellite in low Earth orbit four days after a highly experienced amateur astronomer living in Elgin, Illinois, witnessed an identical UFO. 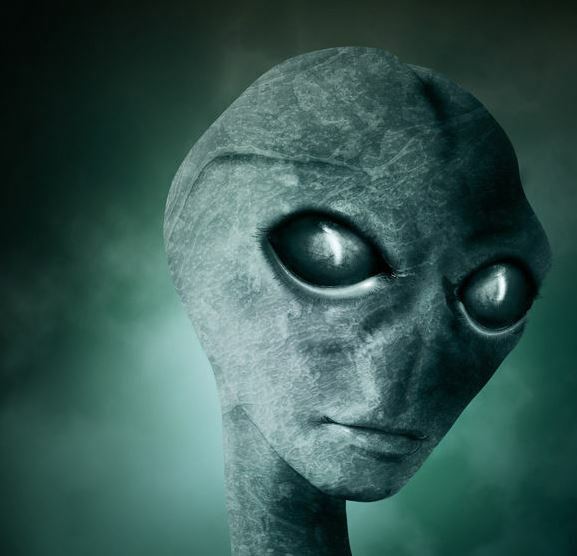 The sightings have sparked speculation in the UFO and alien community that the Elgin witness sighted the same UFO as spotted four days later on live video zooming past the ISS stationed in orbit. 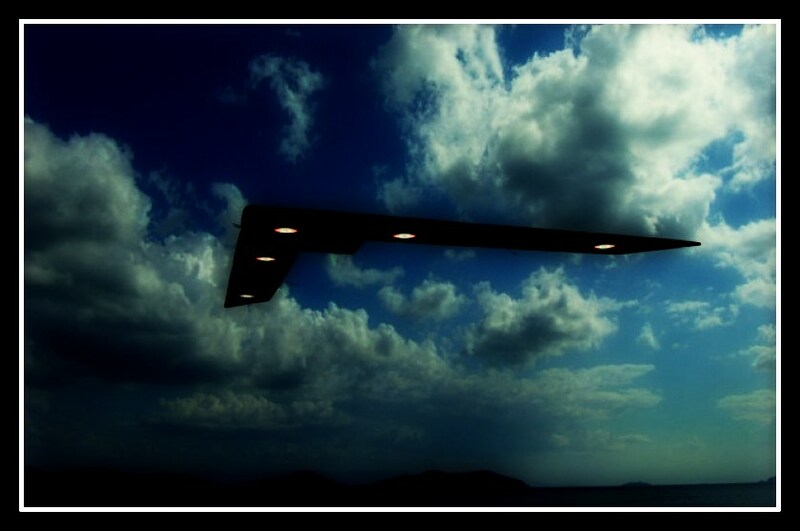 UFOlogists believe that the sighting could be proof of long-held conviction that many sightings of a class of UFOs that include black triangle UFOs and V- or boomerang-shaped UFOs involve alien surveillance crafts and not exclusively black project military aircraft undergoing flight-testing. According to the amateur astronomer in a testimony filed as Case 73663 in the archives of the Mutual UFO Network (MUFON), he was sitting on a lawn chair in his backyard early on January 2, at about 4:30 UTC, searching the clear skies with his binoculars, near the star Arcturus, for the Comet Catalina, when a UFO appeared in the field of view. The UFO was traveling very fast, and silently. It took only two seconds for it to cross the five degrees field of view, according to the witness. He described the UFO as having a dull but uniform gray color and a very clearly defined boomerang or V shape. It had no visible lights, which probably explains why the witness was unable to observe the structural details of the UFO. But he noticed that the arms of the boomerang tapered gradually and that the edges were very clearly defined, yet it did not appear to be entirely flat. 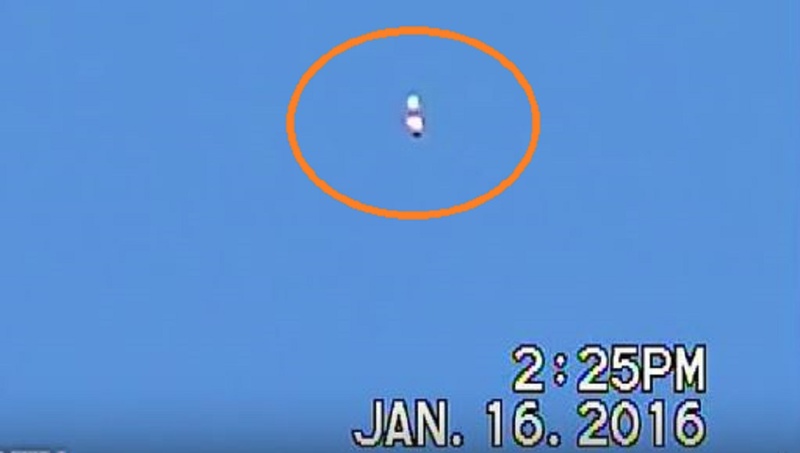 The witness observed the object gliding smoothly from north to south at about 46 degrees elevation without changing direction or altitude. “It appeared to glide very elegantly and smoothly from north to south at roughly 46 degrees elevation. It did not change direction or altitude.” The witness was unable to estimate the actual size of the UFO because of uncertainty about the altitude of flight. But he noted that its angular size was about one degree and that its angular speed was comparable to that of a passenger jet at cruising altitude. He tracked the UFO with his binoculars until it passed behind his house. He got up from the chair and moved away from the house to keep the UFO in view but it disappeared abruptly. The witness was surprised at the sudden disappearance of the UFO. He remarked that he had never seen anything like the UFO in the 50 years of his experience as an amateur astronomer. And while thinking about the sighting, he recalled that his wife, also a highly experienced amateur astronomer, had reported seeing an identical UFO in 1968 while observing the skies from her parents’ backyard on the west side of Chicago. She reported sighting three identical gray-colored, boomerang or V-shaped UFOs that appeared suddenly as she observed the night sky near Orion’s Belt with a telescope. The UFOs then disappeared as suddenly and as mysteriously as they appeared. He also recalled that his parents — also experienced amateur astronomers — reported sighting an identical UFO in 1947. 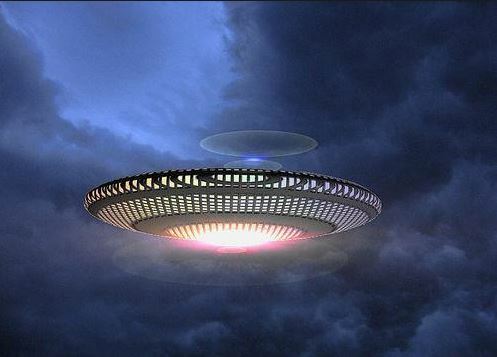 According to the witness’ parents, the UFO zipped silently across the night sky in a matter of seconds — much faster than known jets at the time. The witness noted that the January 2 sighting was baffling and appeared to challenge his conviction that most objectively verifiable but unresolved cases of UFO sightings were either secret military aircraft undergoing flight-testing or unknown atmospheric phenomenon. 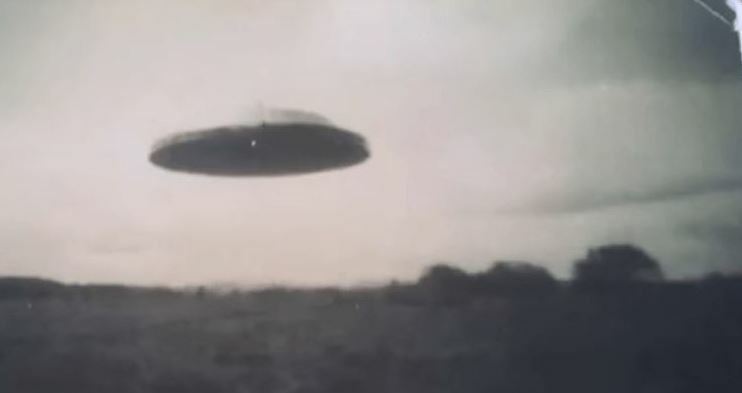 The sighting appears to confirm a widely held view in the UFO community that boomerang– or V-shaped UFOs could belong to a class of alien surveillance crafts related to “black triangle” UFOs. 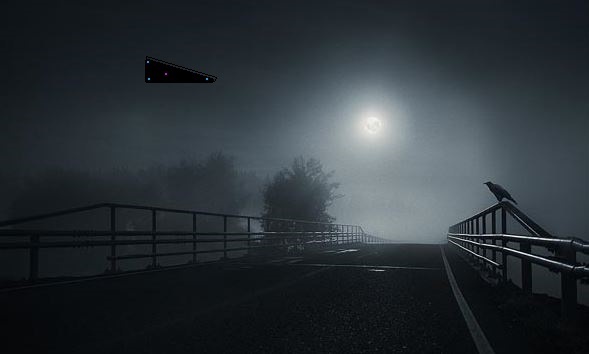 Black triangle UFOs are a special class of UFOs that have been sighted since the late 1980s in the U.S., the U.K., and other European countries. Skeptics believe that the UFOs are linked to highly classified military research and development projects. But UFO enthusiasts often cite the Belgian UFO wave, a series of black triangle UFO sightings that lasted from 29 November 1989 to April 1990, as evidence that some — if not all — could be alien surveillance crafts. During the Belgian UFO wave, Belgian F-16s that scrambled to intercept two black triangle UFOs were outmaneuvered after pilots achieved successful missile lock on two occasions. 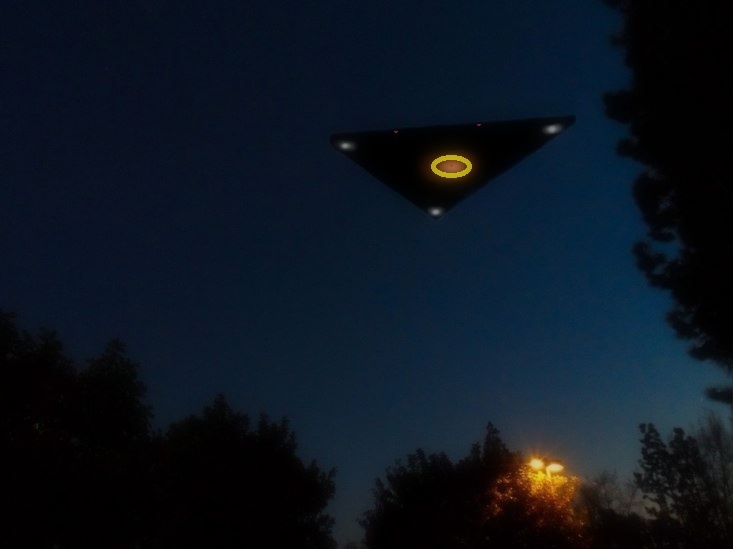 The incidents suggested to UFO enthusiasts that black triangle UFOs could be advanced alien stealth crafts deployed to conduct regular Earth surveillance missions. KENS NOTE: The middle photo was recently taken, dated 1-14-16. We have been receiving , almost daily, images of the I.S.S. and alien craft in orbit. My wife and I both at night and in daylight have seen multiple bizarre craft /we thought it was from the underground Airforce base /my family moved here in 30s to work on a bomb at oak ridge then to the base here to work on flying wing for Northrop )so we didn’t think too much about them other than it was interesting. I am an engineer and what we saw and filmed tonight was so close we were mortified. It appeared to change shape and had bizarre lighting and left lights drop then vanish from what appeared to be the center lower portion. It emitted localized beams at homes near us( they didn’t go all the way like light.. It had a place the light STOPPED) my wife ran inside and I filmed and photographed it and had her load firearms as we were afraid it could be up to something nefarious. Nothing behaving in this manner ISNT. 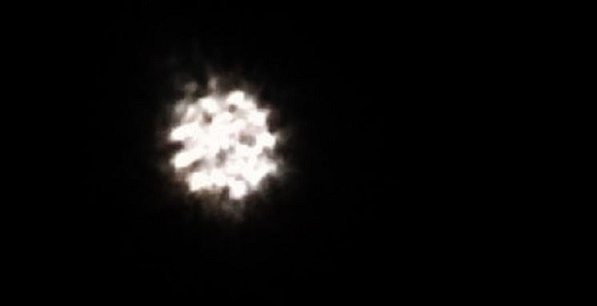 The final photo after zoom on iPhone and crop is (seriously) a silver disc with a dome top like a hat. It’s not anything like the delta wing three globe light craft we witnessed at dusk 2.5 story height. This is something beyond what AEDC is working on. I have never reported before// I have a notebook of drawings of everything we’ve seen and this one is like something from a movie. When a man in St Helens, Merseyside aimed his camera at the sky to catch the first moon of the year 2016, he unknowingly filmed an unidentified flying object (UFO) passing over it. The 43-year-old painter and decorator decided to shoot the New Year’s Eve fireworks from the top of Billinge Hill. When the fireworks display was over, he pointed his Sony camera to the moon for a few minutes while him and mates, who had joined him on the hill, had a beer drinking. After a couple of drinks, they headed back to Mike’s house to watch the video of the fireworks. But to their surprise, they spotted a mysterious object passing over the moon at 12.20am. A non-alien believer Mike said: “I was very surprised as I only meant to shoot the first New Year’s moon. It got my friends and me talking. We kept rewinding it and debating about it. Mike believes it is a satellite, but some of his friends are not so certain about it. .Triangular aircraft with blue/pink lights arranged into a triangle at the base, blinking every second, quiet & hovering low in the sky. I witnessed a triangular flying object by looking out a window from home. At first I noticed very discrete, bright, ping-pong size alternating blue and pink “light bulbs” arranged into a large triangle sitting on the same plane, blinking every second. First I was looking at the intensity of the lights, the blinking frequency, the color and then the light position for about 5 seconds. I was then trying to see a “bigger picture” beyond just the lights. By relying on those blinking lights and a few sparse smaller white light bulbs scattered around that I believe were probably turned on at a later time, I vaguely saw (presumably) the bottom/base of an aircraft. The size was big enough to cover a significant portion of the sky view from my window, I assume the flying object was hovering pretty low and that’s why I could see the individual light bulbs so clearly. It was quiet, no noise. It really took me a while (7 sec at least) to realize what I think I saw. After that moment, I’ve never seen anything even close (at night time, it’s pretty dark outside) to what I encountered during that short moment of witnessing. It was a close encounter from naked eyes. NOTE: The above image is a rendering. I’m in the aviation field and I spend most of my time outside on night shift. Please note that I do not want to be contacted nor can I give anymore details about myself or what I witnessed due to security reasons. Thank you for understanding. Last night, 07jan16, between the time of 19:40-20:00, I witnessed something that I can not explain. During my usual shift, I have a lot of down time between flight schedule where I like to relax and look for shooting stars. We have a really good view of the stars because of the lack of light pollution in this particular area. It was on this precise occasion when I had my sighting. As I was watching the skies which I do periodically every single night during my shift, I observed a giant black SILENT object of some sort that seemed to be gliding. The object was heading north to south at a steady speed. It took approximately 10 seconds from the time I noticed it directly above me until the time it disappeared over some buildings I was standing close to. The runway was NOT being used at this moment so there was no noise coming from any equipment, airplanes, and absolutely no noise from the object. The usual (and only) type of aircraft we have at this location are extremely loud, even at cruising speed. Another bizarre thing to note was this object had no identifying lights. That would be a disastrous idea to fly in this particular airspace with no lights and would mean instant response measures and highly against the law. After my sighting, I was dumbfounded. I told another coworker about what I saw with excitement and since we still had lots of time to spare before we had to get back to work, we watched the skies together for this mysterious object. Sure enough, about 15 minutes later it reappeared in almost the exact same flight path as before, but this time it was moving slower and at an arc going north to southwest. I sighted it first and pointed my coworking in the direction and this person saw it as well. This sighting took approximately 30 seconds. It was not witnessed again. We have no idea what it was because it appeared to not have any engines due to its silence nor any positioning lights. I would estimate that it was between 150-200 feet wide, gliding at an altitude between 500-1000 feet. The night was clear at this particular time with a full view of the stars. The reason I noticed it at all was because it faintly reflected light from our location off of its belly, it was a slightly different shade of black than the sky behind it and it blocked out the stars as it glided. I wish I could give more reasons as to how I know it wasn’t from where I work but I can’t. All I can say is it’s NOT from this location nor was there any indications that anyone else knew it was flying over. We did not report our sighting to anyone in charge for fear of ridicule.